Children participating in the Florida Tax Credit (FTC) Scholarship Program are more likely than their peers to enroll in college and earn a degree. This according to new research from Matthew Chingos, Tomas Monarrez and Daniel Kuehn of the Urban Institute. Launched in 2001, the FTC provides tuition scholarships for low-income families to attend private schools. It is the largest private school choice program in the country. 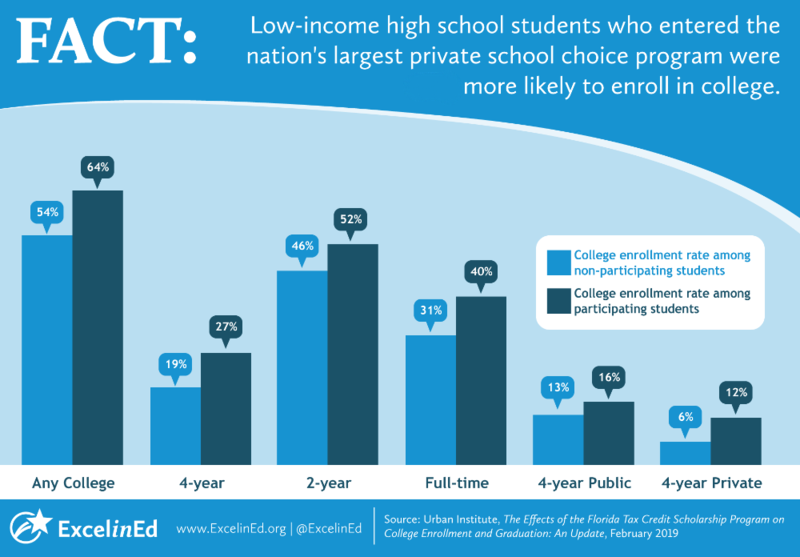 An earlier study found that FTC students were more likely than their peers to enroll in a Florida-based public college. The Urban Institute’s new study builds on previous literature by examining enrollment in all U.S. colleges through the 2018 school year. We find that including data from private and out-of-state colleges yields larger positive effects of FTC participation on both college enrollment and degree attainment. To compare student outcomes, researchers match FTC participants with non-FTC participants who have otherwise similar characteristics, such as math and reading scores, language, nativity, race, disability status, age and free lunch participation. Children benefiting from FTC scholarships were more likely than matched-peers to enroll in two-year and four-year colleges. Students who entered the FTC in high school were 10 percentage points more likely to enroll in college, which amounts to a 19 percent increase compared to their peers. At four-year private nonprofit colleges, the enrollment rate of FTC students was double that of their peers. FTC participation was also associated with a higher likelihood of earning a bachelor’s degree. When students entered the FTC in high school and remained in the program for at least three years, there was no statistically significant impact on earning an associate degree, but those students were 50 percent more likely to earn a bachelor’s degree.